State run telecom major, Bharat Sanchar Nigam Limited (BSNL) has announced exciting Janmashtami Offers 2016 for its prepaid mobile customers across all telecom circles. 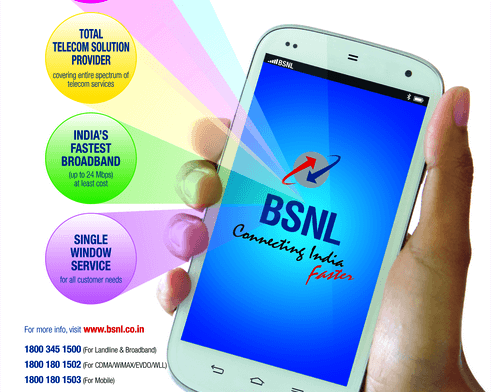 BSNL Janmashtami 3G Data Offers will be available from 25th August 2016 on PAN India basis. As per the latest information, BSNL will be revising the existing 3G Data STV 1099 to offer Unlimited Data without speed restriction with validity of 30 Days. In addition, the PSU will be launching two new 3G data packs - Data STV 156 (2 GB Usage) and Data STV 549 (10 GB Usage) on the auspicious on the eve of Janmashtmi. The above offers will be available on PAN India basis with effect from 25-08-2016. The implementation of the tariff will be made in accordance with 43rd Amendment of Telecom Tariff Order and orders/guidelines/clarifications issued by TRAI from time to time. The above offers are really excellent and most suited to youth segment who always need 24x7 mobile internet connectivity at most affordable tariff. BSNL's 3G data STVs are the best and value for money packs with many exciting features like - Free All India Roaming, Free To Home Services etc. Dear readers, please share your views and opinions about these economic and excellent 3G data offers from BSNL via comments with us. really bst offer.this will increase the revenue and trible the customer base to bsnl. Will this be a promotional offer only during Janmashtami or will continue after this festive season? If it is a regular plan, then superb plan and if not then, we wont get much benefit once this offer is expired in a month or two.Could you please clarify whether this is going to be a regular plan. These offers are Regular Offers from 25-08-2016, no validity limit for these offers. It means, these offers will be available from 25-08-2016 as normal offers. If it is a truly unlimited plan, then please remove the column of "data charge after freebies " from "Revised Freebies" table.I think that is wrongly entered. Are these plans for applicable in kerala only or all india?? Why only 30 days? It would be 60 days sir. Then It would be a great offer. Think twice before you subscribe this offer. It's BSNL. If you get 80kbps speed, you're lucky. If network mode is 3g only, im getting >350 kb/s speed... Its good enough for youth..
3G speed already below 500 Kbps in afternoon hours to midnight in malappuram Dist. . Once these packs in effect, it will be worse . More Bandwidth should be provided else, no use . In Kuwait we are getting 200GB for 2.5KD ie for 550 Indian rupees we are able to use 200GB.ie one GB cost only 2 indian upess and seventy five paise only.so bsnl is not doing any favour or big offer to Its customer.but other telephone companies in India are looting Indian people.see the plans below. BSNL always announces offers for prepaid users. Is any of this offer applicable to postpaid users? Those who are cursing this plan let me tell you that this plan will be game changer for data lovers. 1099 is such cheap amount for anybody for unlimited net on mobile. Many more can share this plan with the help of wifi hotspot. Really good plan but unable to see while doing STV recharge. It means your speed will not be throttled down to lower speed after you Hit a Given amount of GBs..Before the plan was revised...after you Hit 9GB usage...you speed will be reduced to 80kbps...not anymore...but your speed will certainly fluctuate. Unlike landline/cable connection, 3G in Nagaland is very unstable (Airtel and Aircel are more stable in most areas of Dimapur and Kohima)...So how much speed you receive will depend more on your location...like how far you are from the nearest BSNL tower... You should first try some cheap plans...such as 1 GB/day plan..and check out the speed...and decide then. For me my 3G speed constantly jumps around 2mbps to 9mbps(mostly 5-9mbps at night)...and sometimes i get no signal at all....still I can download around 20GB worth of video tutorials a day when i have to. If you do get good signal..go for it. I would like to add that so far this is the best 3g plan for heavy data user...With an average speed of around 5mbps..one can easily consume more than 300GB data in 30 days..which will bring the per GB cost down to less than Rs.4/-. I recharged my phone for rs1100 bt when sending the msg DATA STV1099 to 123 thats hw i usually do it says unauthrizd operatn. Plz hlp me on ths isue how do i activate this 1099 stv plan from my curnt main acnt balance.